1) How many years of his seven-year sentence did Tom actually serve in jail? 2) What’s the name of the ranch where Tom kills the cop? 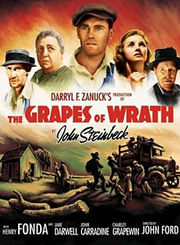 3) What town are the Joads headed for at the end of the movie? 4) How many movies did Henry Fonda make with John Ford? Name as many of them as possible.